From our humble beginnings as small butcher shop well over three decades ago, Perry’s Steakhouse & Grille is now one of the premier steakhouses in the country. Family-owned and operated, the restaurant was founded on the core philosophy of serving only the finest cuts of hand-selected USDA-aged prime steaks cut fresh daily with outstanding service, staying true to our meat market roots. We take great pride in our distinctive signature dishes carved tableside including an unexpected steakhouse specialty – Perry’s Famous Pork Chop, a mouth-watering chop measuring seven fingers high. The award-winning menu features our Symphony Kabob, Chateaubriand, fried asparagus, and other classics with a modern twist. A variety of desserts include flaming creations prepared tableside to finish the fanfare with Perry’s flair. To the delight of wine enthusiasts, Perry’s offers hundreds of wines researched to complement the menu perfectly, including rare vintages as well as Perry’s own private label reserves. And our Bar 79, named after Perry’s birth date in 1979, offers live music, mixology creations with ingredients fresh from the kitchen to the bar, and inviting social hours with bar menu items made for sharing. 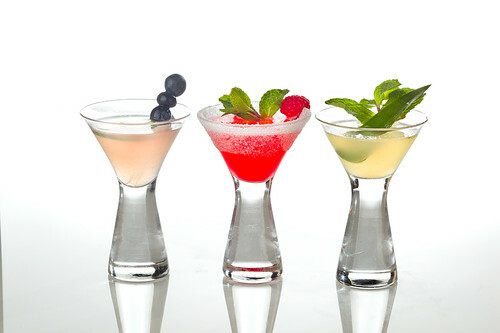 It’s a great place to enjoy a dessert wine or after dinner cordial – or Bar 79 can be your destination for the evening. Beyond this long-standing passion for five-star food and service in a vibrant yet comfortable environment, Perry’s offers the most unique private dining experience for your most important business and personal moments. It’s the perfect venue for your every occasion, from an intimate dinner to an important meeting to a celebration or family gathering to a large group. The Perry’s family has redefined dining with an experience that is truly Rare and Well Done®. 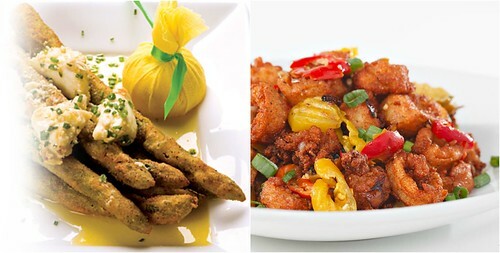 We first started with Perry's Signature Fried Asparagus topped with fresh lump crabmeat and their Cherry Pepper Calamari. Both were excellent where the fresh asparagus were lightly fried in a batter. The asparagus retained a firm crispness and the lump crabmeat was a delicious pairing. The calamari had a very subtle heat and was a nice twist on the traditional calamari served at other restaurants. Our second course were the salads. The Baron opted for the Chopped Salad with Applewood Smoked Bacon. It was very good and full of great textures and flavors. 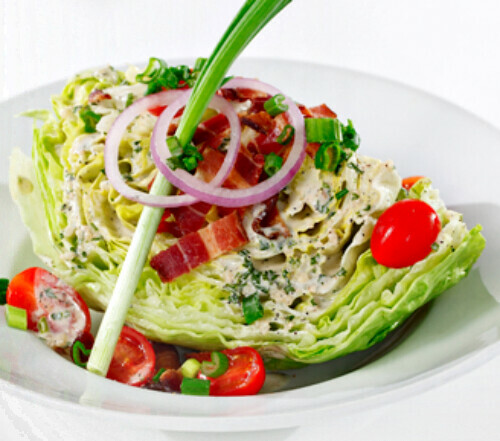 I opted for the Iceberg Wedge Salad with Applewood Smoked Bacon. The name of this salad is misleading... as it's not a wedge but rather a whole half head of iceberg lettuce. It was delicious, fresh and it came with a housemade dill ranch dressing that went perfectly with the salad. Next up were our amazing entrees. We came to the restaurant thinking that steak would be what we would enjoy... but much to our surprise, Perry's Famous Pork Chop was the hot menu item here. The massive pork chop was cured, roasted, slow smoked, and caramelized was carved tableside and served with a homemade applesauce. 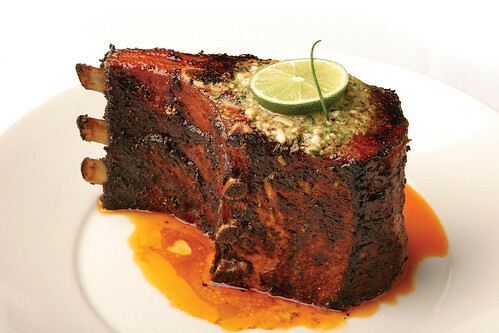 Once carved, it was divided into three sections - the eye, the rib and tenderloin. Each were amazing and hands down, it was the best pork chop we've ever had. We also had the special of the night - a Chateaubriand steak accompanied with a trio of sauces. Served medium rare, it was succulent and melt in your moth delicious even without the trio of sauces. To finish off our night, we couldn't leave without having dessert. 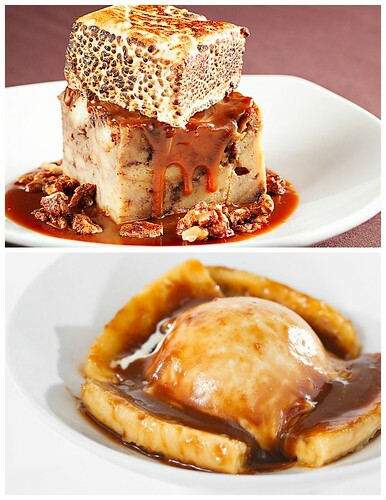 We enjoyed the Rocky Road Bread Pudding where butterscotch bread pudding studded with chocolate chips was drenched in a caramel sauce, topped with candied walnuts and a giant toasted homemade marshmallow. If that wasn't enough, we also had Bananas Foster prepared tableside. Such a nice, personal touch with a little flair! Overall, it was an amazing dinner and a great addition to the Chicago area. I hope they continue to expand to other areas outside of Texas and if you are in the Chicago area, please visit... you won't be disappointed! I'm drooling! And just scheduled a steak date night after the holidays.